When it comes to green leafy vegetables, kale is one of the most versatile around. This veggie can be sautéed, toasted (add to popcorn for a healthy and delicious movie night treat), added to soups, or served raw. Not many other green leafy veggies can be subjected to so many types of cooking. We recently encountered the joys of eating kale raw as a salad while on a trip to Seattle, and honestly, it’s delicious. We serve our salad with an almost vegan Caesar dressing (the honey gave it a needed sweetness) inspired by Galeos Caesar dressing (we learned of the dressing from Chow.com). Our version uses miso and some dried cured olives to give the dressing the “fishy” flavor usually obtained from anchovies, and the miso is a great emulsifier so there’s no need for the egg or mayo. And even though roasted beets and avocado are not usually found on a Caesar we thought the earthy flavor of the beets and the creaminess of the avocado fit perfectly, you can leave them out if you’re a Caesar purist. Of course, if you’re a true Caesar purist you won’t be using kale, miso, or cured olives. The salad is delicious and vitamin-packed and it’s even good enough to please the iceberg lettuce munchers in your family. In a large salad bowl, add the cured olives, garlic, miso, lemon juice, honey,and 4 tablespoons olive oil. Whisk until emulsified. Taste then add salt and pepper, and more olive oil if needed. Add the pieces of kale, parsley leaves, and diced roasted beets to the bowl. Toss until the kale leaves are fully dressed. 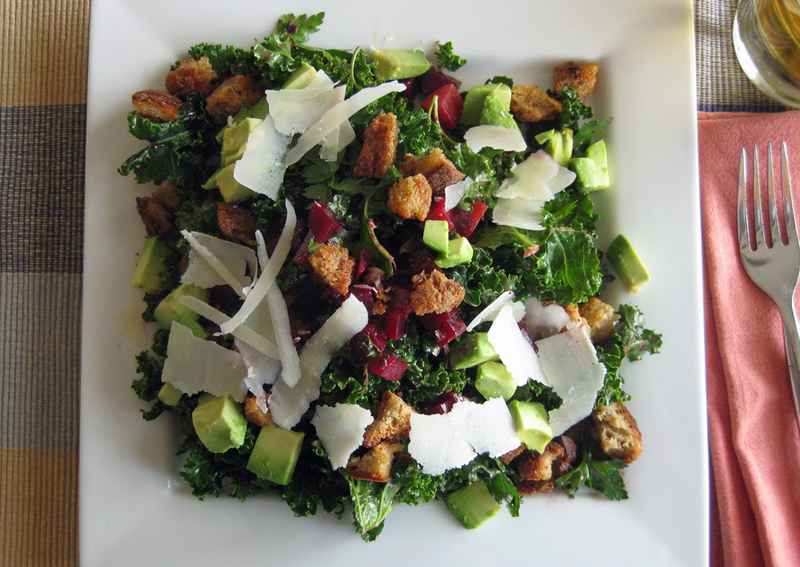 Plate the salad and top with diced avocado, croutons, and ribbons of Parmesan cheese***. *To roast the beets; scrub the beets, then place them in a small foil-lined roasting pan. Pour a couple tablespoons of olive oil over the beets, cover and seal with another piece of foil. Roast in the oven at 450 degrees for 45 minutes to 1 hour +, or until beets are knife tender. Allow to cool before peeling the skins and dicing. **Pieces of old bread make great croutons. Freeze small pieces of left over bread and when ready to use for croutons, remove from the freezer and lightly thaw. Cut or break into bite-sized pieces and pan toast them in a sauté pan with olive oil and minced garlic until lightly browned. ***Use a vegetable peeler to make ribbons.